The belly of an Adjudicator. 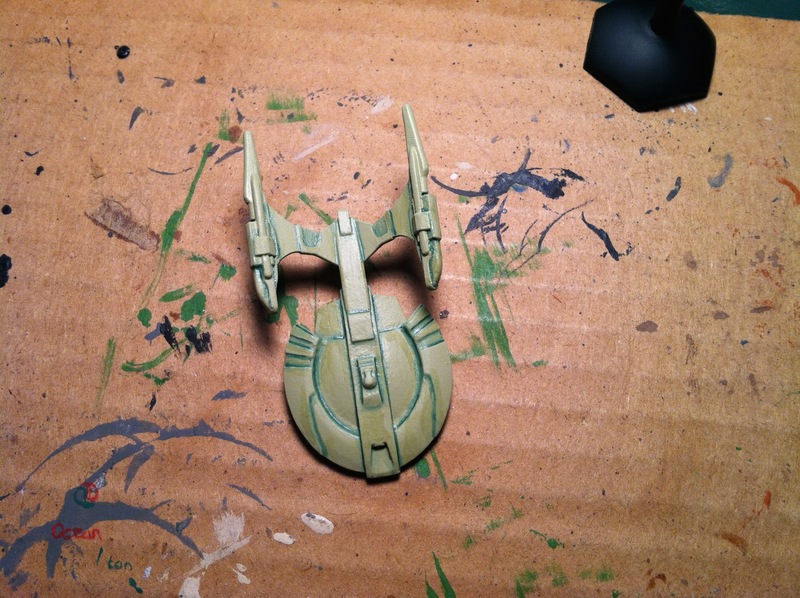 Since the yellow shade does remind one of green, I went with a green wash. (Specifically, half Citadel Coela Greenshade and half Lamia Medium.) Again, I’m just grabbing out of my collection, and I didn’t really intend using a blue-green. But it works. 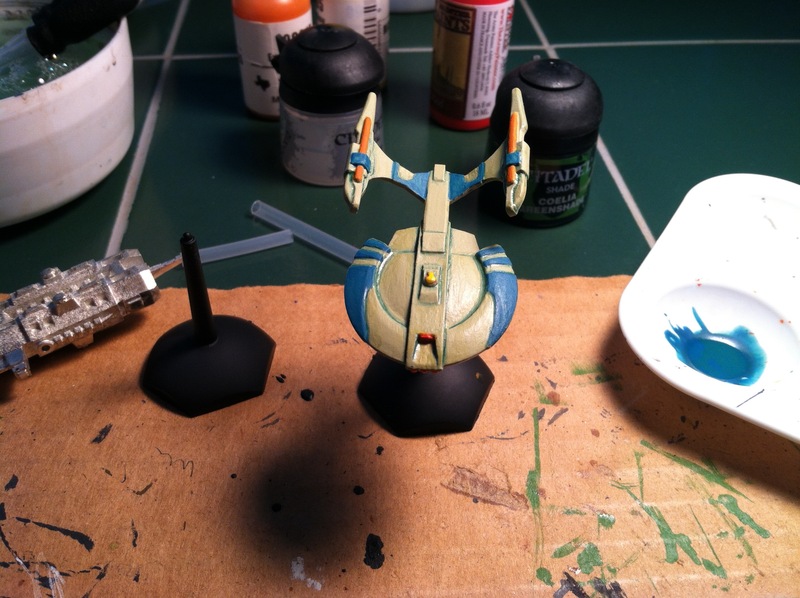 The only plan I had at this point is to paint the bridge yellow, the weapons mounts red, and the “warp coils” on the nacelles orange. 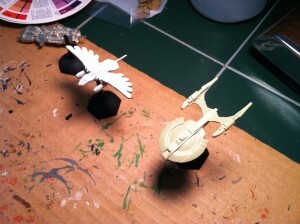 But I wanted to do the design justice, and reduce the Star Trek-i-ness of the final model. 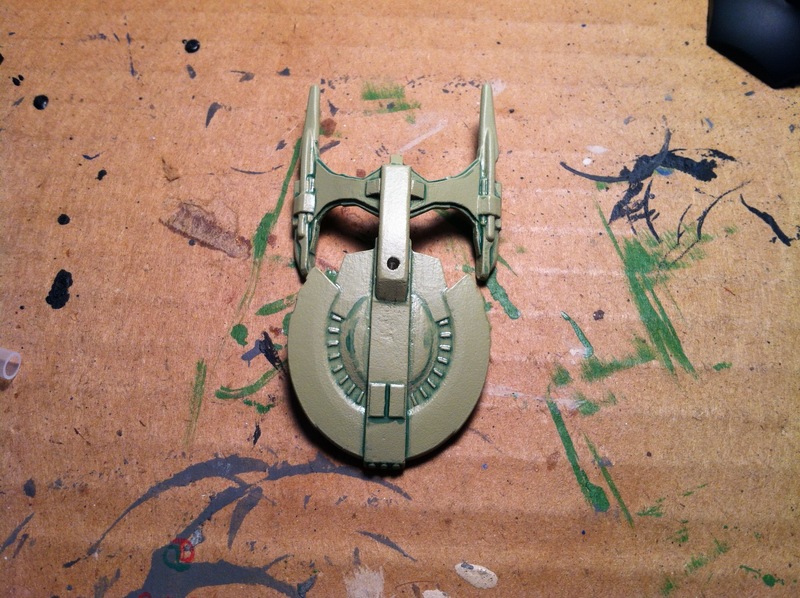 So I mixed up some blue-green of my own, and painted the fangs on. Pretty good, but the color balance is off. It needs a little more of that blue-green, right? Better, but now the accent balance is off. Time to reduce the number of colors, and switch out the yellow and red for more orange. 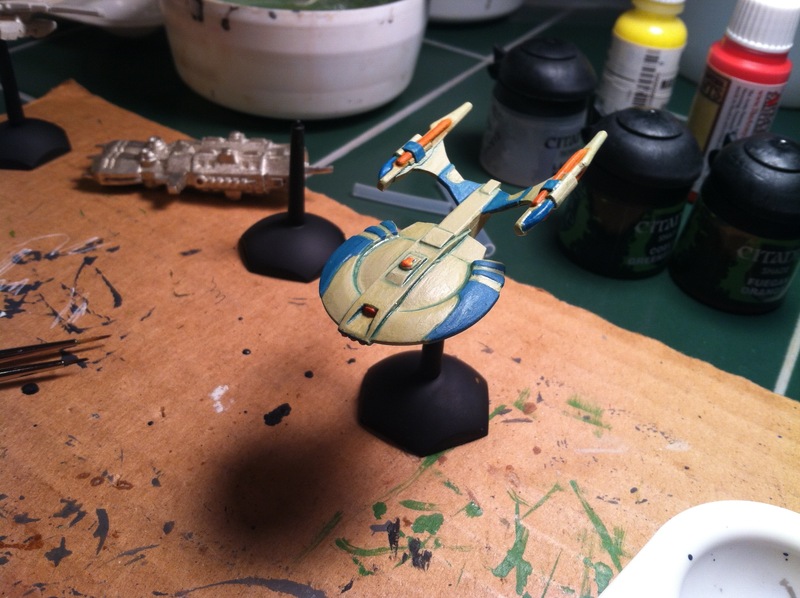 Normally, this is where I’d call it done, as I don’t normally need to seal my models. 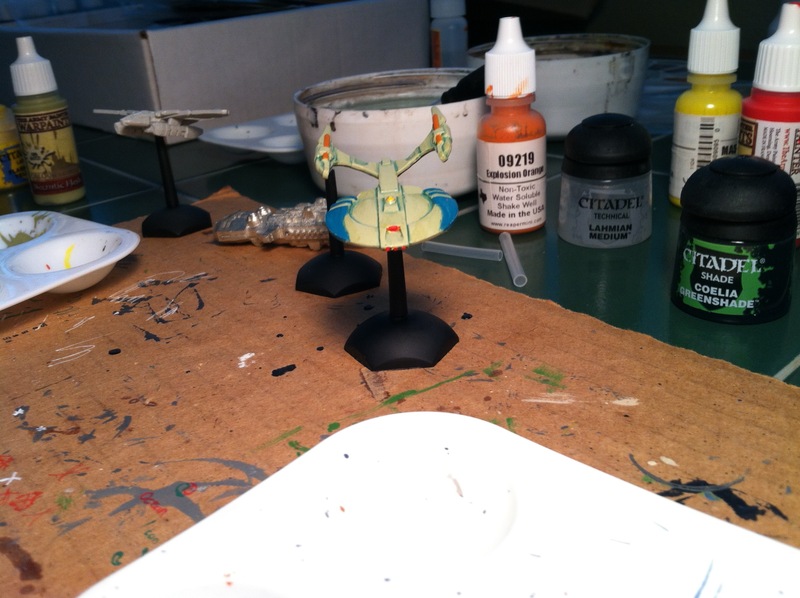 But this one … well, I’d already had to repaint a couple of grip spots on the ship, and was pretty sure that nobody would end up handling the Adjudicator by its base. So out came my hardly-used can of Purity Seal, and onto the mini it went. When I started this, I had just planned to paint up one of these as part of my demo kit. Y’know, to hint that you can still use your Trekkie models if you tire of Attack Wing. But the results were better than I expected: this might exist in that universe, but it is not a Federation ship. I also found myself thinking that it would be worthwhile to paint one of these to display grade, instead of gaming grade (like I’ve done here). That’s a good sign, and I might find myself buying a fleet of Xuvaxi in the future. The paints that ended up on the final model: Reaper’s Explosion Orange, and a 4:1 mix of Reaper’s Grass Green and Army Painter’s Crystal Blue. While the results of the mix might be acceptable, the two paints kept trying to separate, which was an odd experience. If I paint matching Xuvaxi, I’m going to buy a blue-green off the shelf. Lastly, there’s a Fuegan Orange wash around the warp coils, as I was trying to go for a glow effect. I’m not sure it’s all that effective on the Necrotic Flesh, though. To get a really good glow effect, I think the unlit areas need to be something much darker. This entry was posted in Starships and tagged Irrational Designs, Studio Bergstrom, workbench. Bookmark the permalink.